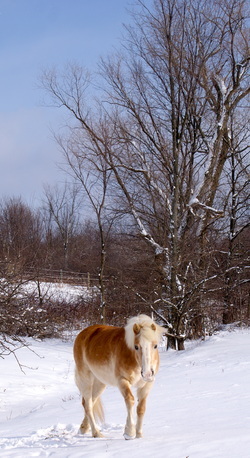 Haflinger Ivy enjoying some winter sun. At Cessna Stables, care that takes your horse's physical and mental health needs into account is a high priority. We believe that group turnout (as much as possible) is extremely important for the mental health of your horse. The result is a horse that is happier, calmer, and easier to get along with. From May-Oct horses go out in the evening and come in in the morning, for about 15 hours. From Oct-May they are out for 8 hours during the day. Turnout is limited only by very wet weather (usually March/April) and thunderstorms. Horses go out divided by groups of mares, geldings, and senior citizens. Our stalls are very open visually and half of them are open fronts, allowing for horses to get plenty of fresh air and interaction with their neighbors. Recent research has clearly proven that horse's whose social interaction is limited are clearly more stressed than those who get regular interaction with other equines. For the most part, board is limited to those who are participating either in the lesson program or training program at Cessna Stables. This makes for a cohesive group that is on the same page in terms of their equestrian goals and ideals. We are a no drama barn and cliquey behavior is not tolerated. We are also a predominantly adult barn making for a peaceful, mature learning environment. Classical Training (Dressage) and Horsemanship principals are the core of our lessons and training. While many of our clients do compete, those that do not are just as welcome. We have a wide variety of horses here although the "hairy" breeds seem to dominate! Our clients have Haflingers, Friesians, Andalusians, Morgans, a Gypsy X, a Fjord, Draft X's, Quarter horses as well as various others. In order to make continued learning more accessible to our clients we offer a student discount to those who participate in lessons or one of our training options. Lessons on your horse are also $5/less than lessons on school horses. Board for (min.) bi-weekly students (2 lessons/month) = $375/month. Example: 2 (private 30 min.) lessons = $60 + $375= $435 Lessons must be prepaid and must be used within the month. However make-ups are allowed if cancelled with 24 hours notice. Board for non-students is $400/month. DAILY TURNOUT on 15 acres of Electro-braid fenced pastures only limited by very wet weather. Extra large 10x14 stalls cleaned monday - saturday. Plentiful grass hay and a high fat pelleted feed. 145x60 indoor arena raked and watered regularily. Peace of mind in knowing your horse is well cared for and getting outside, even if you can't be here. A friendly, welcoming barn community with a positive atmosphere.